Last-minute cancellations mean a day of work lost. We work hard to have some of the most experienced guides in the region and this policy gives them some reliability in their career. If the day is cancelled due to inclement weather*, the day can be rescheduled, or the deposit will be refunded. Confirmed cancellations for local events in the Shawangunks or Catskills received at least 14 days prior to the date reserved will have the reservation fee returned or credited to another day. Cancellations for local events within 7 to 14 days of the reserved date will receive credit toward another day. Cancellations for local events within 1-7 days forfeit their reservation fee. Cancellations less than 24 hours or No-Shows are held to full payment. The final balance is dependent upon the size of your party that you originally scheduled. We base the amount of guides for the day on a 4:1 ratio. If your party size decreases to a number resulting in less guides needed, please let us know as soon as possible - if its less than 7 days before your scheduled day, we will need to charge you to cover the extra guide(s) scheduled. If your party size increases, we need to know as soon as possible to be able to schedule another guide and will adjust the rates according to the new amount of participants. 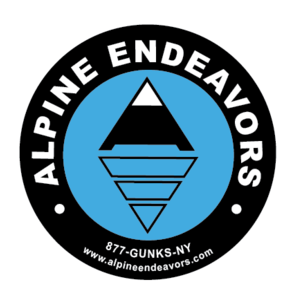 Deposits or payments for special courses (including Shawangunks and Catskills), trips to other locations (other than the Shawangunks or Catskills ), and payments for gift certificates or our Frequent Climber Card are non-refundable. For all of our away trips, we highly recommend you purchase Travel Insurance. The weather changes daily - please contact us the evening before your scheduled day if you have concerns about the weather. *Weather cancellations are up to the guide to decide, not the registrant. If we experience bad weather locally in the Shawangunk, Catskills, the day will be pro-rated to full (four or more hours) or half-day (up to four hours) rates. Bad weather is always a possibility in the mountains, so there is no rescheduling or refunds for remote or multi-day trips when we are out there in the field. Although we can plan to climb a specific route or peak, no guarantees are made (in the mountains, anything can happen). Our purpose is to use our judgment and experience to share with you a rewarding experience, both up and down. If an unsafe situation arises, the guide makes the final decision and may turn around. There will be no refunds or rescheduling. However, if time allows, while we are on the trip another attempt may be arranged.